&Stitches: Yes, that is embroidery! stumpwork sparrow, a photo by Sewphie T on Flickr. 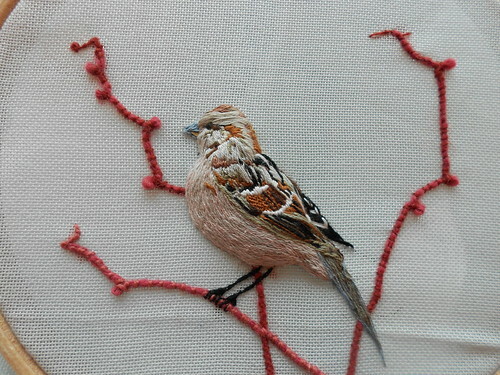 This stumpwork sparrow by Sewphie is absolutely amazing! The details and just how real it looks. Stunning, inspiring! Read more about it on Sewphie's blog. Thanks for blogging about my bird- very happy to be featured on one of my favourite blogs! beautiful. Stumpwork just amazes me. How do you always find the most amazing embroidery on the web?! I want to touch this!